Despite the fact that fat is high-calorie product, it contains a large amount of nutrients. It is rich in vitamins a, D, E, selenium, arachidonic acid and other fatty acids responsible for the immune system and the heart, a toxin, besides, it is not carcinogenic and radioactive. Experts agree that fat should be included in the diet. There are several methods of salting bacon: "wet" (using brine), dry (with spices) and "hot" when the fat is subjected to heat treatment. Rinse and dry the piece of bacon. Mix salt, pepper, dry herbs and pounded into crumbs Bay leaf. Grate the fat the mixture, then cut and feed a piece of garlic and carrot. They must be pre-cleaned and cut into thin slices. Then put the bacon in a plastic bag and tie it up. From top to wear another bag and also tie off. Then place prepared for salting the fat in a saucepan, cover with water, place on low heat and simmer 45-50 minutes after boiling. Fat – high-calorie product with a high content of cholesterol, so it is recommended to consume no more than 100 grams a day. Then carefully remove the fat from the pan, remove from package and refrigerate. Then put a couple hours in the refrigerator, cut thin slices and serve. You can also cook the smoked bacon at home. Despite the simplicity of the recipe, the fat comes out tender with a hint of smoked meats. First of all make a marinade. To do this: boil water and add onion peels, Boil it for 5 minutes, put salt, pepper, Bay leaf and bacon in one piece. Cook it for 10-15 minutes, then remove from the heat and leave in the brine for 6 hours. During this time, the fat will become a pleasant color and taste of "smoked". 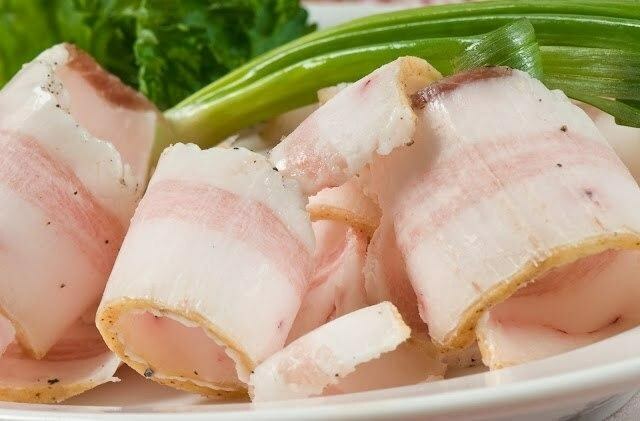 Then remove the bacon from the brine, dry it wow a paper towel or napkin and make small incisions (approximately the width of 2-3 cm), place them cut into thin slices the garlic cloves. Then wrap the bacon in paper towel and put in the freezer for a day. After this time a delicious "smoked" bacon is ready to eat. For baking it is better to choose bacon with meat streaks. Garlic cloves peel and slice thin strips. Fat rinse and dry with a napkin. Then, after making small incisions, nashpiguyte garlic. Mix salt, black pepper, spicy dried herbs and other seasonings, selected according to your taste. Grate the resulting mixture of fat and carefully cover it from all sides with prepared mustard. Prepared then wrap the bacon in foil and leave to marinate for 3-4 hours in the refrigerator. Preheat oven to 180-200oC, place the foil-wrapped bacon on a baking sheet and place in the oven for 45 minutes to bake. 10-15 minutes until fully cooked unwrap the foil and let the fat brown. Baked bacon is served chilled.